When you create a new Profile item, you will be asked to provide certain supporting information. The fields that you are asked to fill in will differ depending on which Profile item type you are trying to create. Description:Type in part of a diagnosis or problem and press enter. Choose the correct item from the search results list. 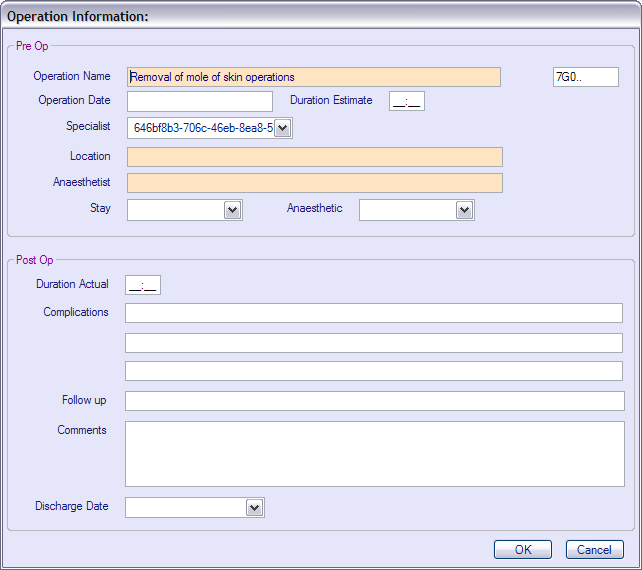 The disease code will automatically be filled into the field beside description. If you wish, choose a colour from the drop-down menu to highlight that Profile item when it is displayed. Blank: if you leave this blank this item is added to letters and displayed in the Profile panel in the normal way. Private: this is displayed in grey in the Profile panel and it is not attached to letters. Hidden: there will be a blank line displayed in the Profile panel so that it is not visible to others looking at your screen (e.g. if the patient comes in with other family members). Click on the blank space to view the description. These items are not attached to letters. Comment: enter any additional information. This will be displayed in the Profile Items list as a sub-heading. Age/Year:The date or age when this problem began. Status: e.g. severity. This will appear in brackets beside the item in the Profile list. Motivation: Choose from the drop-down menu. Description: Type in part of a diagnosis or problem and press enter. Choose the correct item from the search results list. 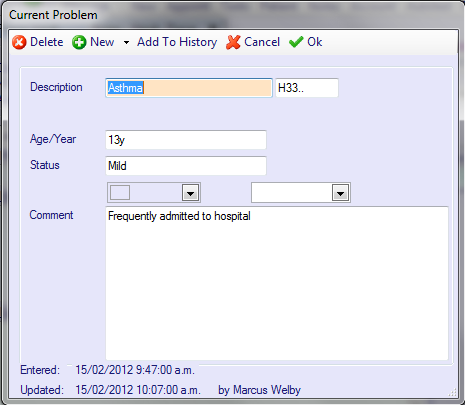 The disease code will automatically be filled into the field beside description. Relation: Enter how the patient was related to the family member. This will appear in brackets next to the item in the Profile list. Operation Name: Type in the name of the procedure and press enter. Choose the correct item from the search results list. 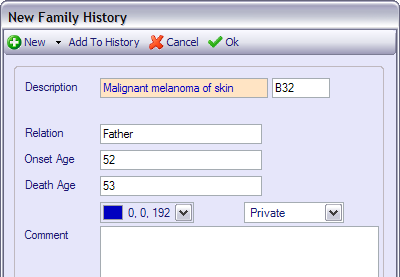 The disease code will automatically be filled into the field beside description. Specialist:Â Choose as appropriate from the drop-down menu. Stay:Â Choose as appropriate from the drop-down menu. Anaesthetic:Â Choose as appropriate from the drop-down menu. Discharge Date: Type in the date and time, or choose by clicking on the right date in the Calendar using the drop-down menu.